Unlike a dog that will show his happiness by wagging his tail or bouncing around, cats are more subtle in their approach to happiness…or any other emotion, really. We’ve scratched through the mounds of information from pet experts to put together a list of “happy” signs your cat is probably exhibiting on a daily basis. When you come home from a long day away and your cat greets you at the door with its tail straight up in the air, this means “hey! I’m happy to see you.” The straight tail may also have a crook at the end or even quivering (the ultimate happy). She may even have her eyes slightly closed and rub gently up against you…all good signs that your cat is happy. While not all cats are as verbal as the beloved Siamese, our felines are still articulating their happiness through everyday sounds. According to Modern Cat, our feline friends may make utterances of chirps, trills and chirrups as a sign of excitement and happiness. Purrs that are accompanied by deep kneading or relaxed behavior is also another good sign that your cat is happy. We as pet parents may take for granted the postures our cats take when they are resting or sleeping as just “normal.” But a relaxed cat can actually say a lot about its mood. A cat resting with its paws tucked under its chest, ears forward and eyes half-mast is a happy and content kitty. Half-closed eyes or the slow blink in your direction is also a sign of contentment and well-being. Have you caught your cat lying on its back with all four paws in the air? Be honored as this feline if feelin’ fine and is extremely happy and relaxed. Cats like to “cuddle” and will show it in different ways. A kneading cat is resorting back to the contentment and happiness it felt as a kitten while kneading its mom to produce milk flow. A cat-cuddle can also include just sitting on your lap, purring while you gently stroke her fur. The ultimate cat-love demonstration is a cat that will actually put its paws around your neck. This kitty-hug is wonderful to experience, although it can be quite rare. A well-kept cat is a happy cat. The feline species will groom themselves, and other cats in the household, when they are feeling good and are trusting of their companions. Some cats will even go as far as grooming their pet parent’s hair. This is one happy cat! Like people, cats that are confident are usually very happy. 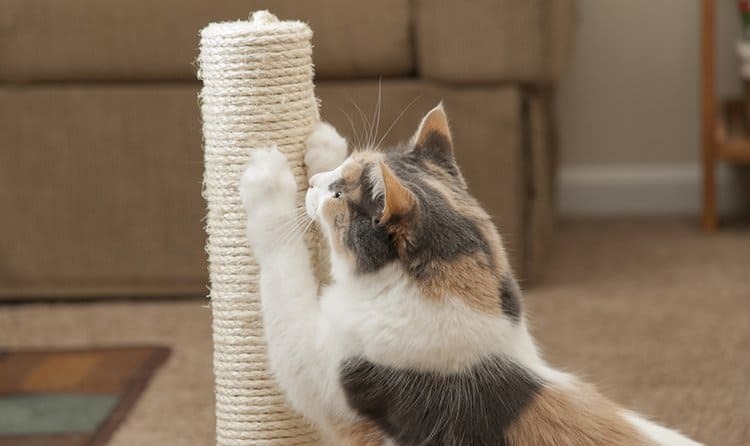 Your cat may show his happy-confidence by “helping” you with your daily chores or by just sitting high up on a scratch post in the supervisory position. Either way, your cat showing an interest in his environment is happy and content. As the old adage goes…curiosity killed the cat. For anyone that have ever pet parented a cat, they know this statement is more than true. Happy cats will usually investigate anything and everything in their household, especially if it’s new to them. Although this behavior can become a bit annoying to us, we can take comfort in the fact that this means we have a happy cat…just remember that after he breaks that new centerpiece you’ve just brought home. It’s easy to tell by play-mode when a cat is happy. Kittens are non-stop bundles of playful-happy, but as they mature the amount of time spent playing often diminishes. However, even an older cat will bat around a toy, take a swat at something dangling or even just zoom around the room with random spurts of energy. All this indicates that your cat is happy, regardless of his age. None of us want our felines to be sad. If your cat isn’t exhibiting any of these happy-cat behaviors, then you may want to visit your veterinarian to make sure your kitty isn’t feeling ill. If all checks out health-wise, you may need to spend more time engaging with your feline friend. Try a new toy, a gentle grooming session, or some yummy treats. Encouraging your cat to be happy will allow you peace-of-mind and give your cat the stimulation he or she desires and needs to stay healthy. My kitties are super happy this I knew, but I read this to be absolutely positive!